In such a fast-paced digital media landscape, it is hardly a surprise that the power of the internet has such influence on the business world. Social media has been dominating the internet’s social scene since Harvard University student Mark Zuckerberg founded social networking phenomenon, Facebook. Since then, the expansion of social media has been extraordinary with the likes of Twitter, Google + and LinkedIn also becoming prevailing characteristics of the 21 st century. Moreover, these sites have evolved to the extent where even businesses are recognising that social networking is becoming an integral tool for organisations. Even here, at Hampshire Mezzanine Floors, a Business to Business (B2B) orientated company, we are able to utilise these social media sites in order to communicate and build relationships with target audiences, including customers and the industry as a whole. We are now active on a number of sites including Google +, LinkedIn, Twitter and Facebook, where we post a wide range of regular updates of what is happening at Hampshire Mezzanine Floors, from internal news such as additions to our team to links to our case studies where you can read all about our latest work. Moreover, world-leading digital networking video site YouTube is going to have a significant impact on HMF’s digital part of the business, providing our target audiences with the opportunity to see videos of what we are able to do. Hampshire Mezzanine Floors are a principal contractor that carries out the complete fit out for your premises. 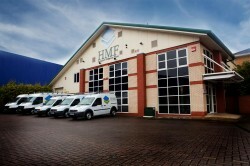 HMF mainly work in industrial warehouses, factories, retail trade premises and offices. This work often involves mezzanine floors, shelving and racking, building works, mechanical and electrical installations.